Lineage. Established as 341 Air Base Group on 7 Jun 1955. Activated on 1 Sep 1955. Inactivated on 15 Jun 1956. Redesignated as 341 Combat Support Group, and activated, on1 Jul 1961. Organized on 15 Jul 1961. Inactivated on 7 Jul 1989. Redesignated as 341 Support Group on 29 Aug 1991. Activated on 1 Sep 1991. Inactivated on 15 Jan 1992. Activated on 1 Jul 1994. 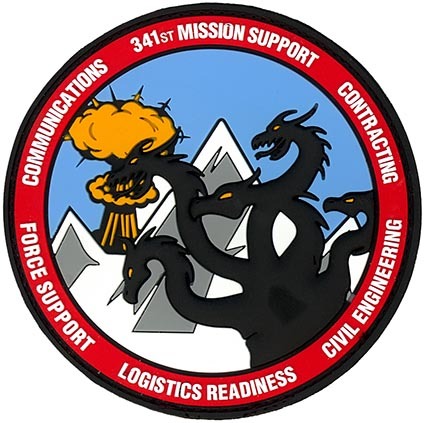 Redesignated as 341 Mission Support Group on 1 Oct 2002. Assignments. 341 Bomb Wing, 1 Sep 1955-15 Jun 1956. 341 Strategic Missile Wing, 15 Jul 1961-7 Jul 1989. 341 Missile Wing, 1 Sep 1991-15 Jan 1992. 341 Missile (later, 341 Space) Wing, 1 Jul 1994-. Stations. Abilene AFB, TX, 1 Sep 1955-15 Jun 1956. Malmstrom AFB, MT, 15 Jul 1961-7 Jul 1989. Malmstrom AFB, MT, 1 Sep 1991-15 Jan 1992. Malmstrom AFB, MT, 1 Jul 1994-. Operations. Provides the critical war-fighting and peacetime support to the 341st MW, including supporting 43 units and tenants, resource protection, engineering and construction, disaster preparedness, personnel administration, communication services, recreation facilities, dining and lodging services and worldwide contingency mobility forces and also prepares and deploys expeditionary combat support forces in support of operations around the world. Decorations. Air Force Outstanding Unit Awards: 22 Oct 1962-31 Dec 1963; 1 Jul 1975-30 Jun 1976; 1 Jul 1976-30 Jun 1977; 1 Jul 1978-30 Jun 1980; 1 Jul 1980-30 Jun 1981; 1 Jul 1988-14 Jun 1989; [1 Sep] 1991-[15 Jan] 1992; [1 Jul]-31 Aug 1994; 1 Sep 1994-31 Aug 1995; 1 Oct 1995-30 Sep 1996; 1 Oct 1997-30 Sep 1999; 1 Oct 1998-30 Sep 1999 (not same as previous honor); 1 Oct 2000-30 Sep 2002;1 Oct 2002-30 Sep 2004; 1 Oct 2006-30 Sep 2008; 1 Oct 2008-31 Sep 2009; 1 Jan 2010-31 Dec 2011. Emblem. Group will use wing emblem with the group designation in the scroll.